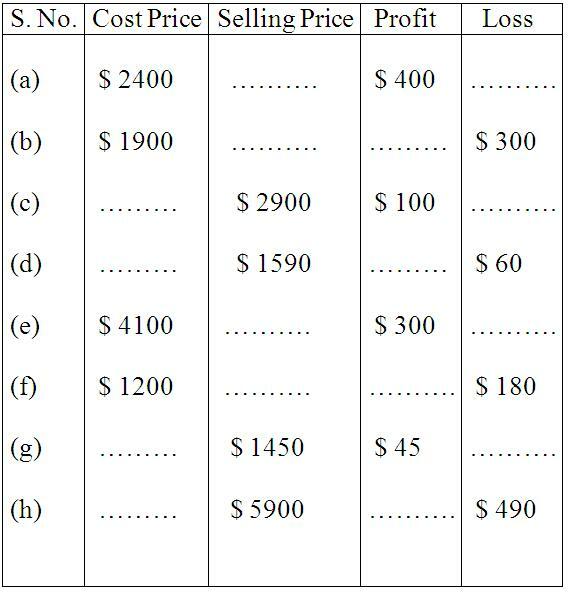 In worksheet on profit and loss, we can see below there are 15 different types of questions which we can practice in our homework. 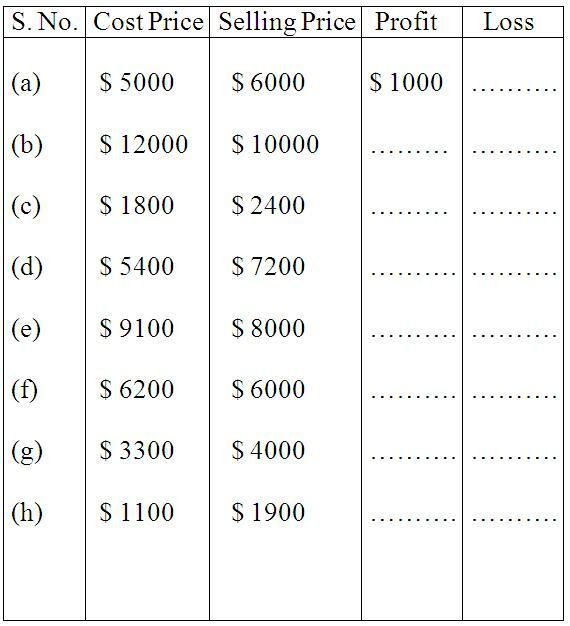 From question 3 onwards we can see word problems on profit and loss. Word Problems on Profit and Loss. 3. A TV was bought for $ 18,950 and old at a loss of $ 4780. Find the selling price. 4. A second hand car was sold for $ 190000, at a loss of $ 85. Find the CP of the car. 5. Jane sold her genset for $ 20000 at a profit of $ 1737. Find the CP of genset. 6. Abraham bought a music system for $ 6375.00 and spent $ 75.00 on its transportation He sold it for $ 6400.00. Find his profit or loss percent. 7. Joy bought pens at $ 120 a dozen. He sold it for $ 15 each. What is his profit percent? 8. Simi bought a study table for $ 9000. She sold it at a profit of 20%. How much profit did she make? What is the selling price? 9. Find the selling price if the cost price is $ 1200 and loss percent is 25. 10. Marshall bought 20 refills and sold them at $ 4 each. If it had cost $ 50 for the refills, what was his profit or loss percent? 11. Mr. Smith buys pencils at $ 250 per hundred and sells each at $ 1.75. Find his loss or profit. 12. Davis bought a second hand cycle for $ 500. He spent $ 80 in repairs and $ 175 in repainting. He then sold it to John for $ 900. How much did he gain or lose? 13. A fruit vendor bought 600 apples for $ 4800. He spent $ 400 on transportation. How much should he sell each to get a profit of $ 1000? 14. Tim bought a box of chocolates for $ 650 and sold it to Tom at a profit of $ 75. Find the selling price. 15. David bought 2 dozen eggs for $ 56. Since 6 of them broke, he incurred a loss of $ 20 on selling them. What was the selling price of one egg?